If you are old enough, you may recall the old Sierra adventure games that were wildly popular during the 80s and early 90s. In recent years this fine genre has effectively died, but it is kept alive by hobbyists and ameteur programmers who remember these games with nostalgia from their childhoods. The Garry Church Chronicles is my first attempt at creating a true Sierra-style adventure game. Garry Church is a retired widowed detective. He is taking the oppertunity to travel to the colony on Thorat II where his first grandchild has just been born. 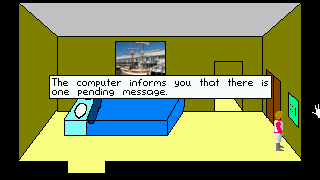 Trouble is never far away though, and it enter’s Garry’s world in the form of a message from an old friend. During the long space flight, Garry will encounter mystery, murder, hijacking and strange life-forms. 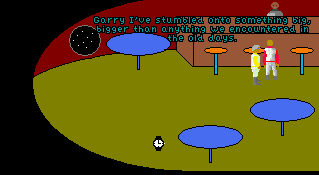 The game is plot-driven with the kind of puzzles that you have come to expect from an adventure game. 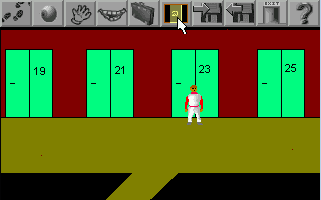 The game features a familiar mouse-driven interface as popularised by Sierra’s SCI games.